Your lemons are lovely and fresh, my mouth is watering and thinking what tasty things you can cook with the ginger and lemon. WOW! Your work is stunning! I'll be following. Love your colors. Beautiful How did you get the colours so bright and radiant? Beautifully done! You made me realize that I haven't made any honey ginger chicken in a long time. Both drawings are excellent. The see pods are performing a delicate dance. The lemons make my mouth pucker. These are wonderful drawings, good enough to eat! I love all your drawings! I really think you should make a calendar with them! Do you have an Etsy shop? Very, very nice - both of these. 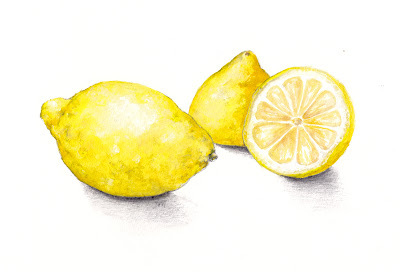 I like both the delicate colouring in the ginger and the bold fresh colouring of the lemon. I went down to see all your beautiful sketches I have missed. You have a beautiful style. i love the lemon, the ginger (we never get them like this here in Montreal) and also the octopus, so delicious! Delightful sketches! I love the seed pods too. I'll never tire of looking at these! Wonderful works! The lemons look so juicy and the colors in the ginger are amazing. The ginger looks like it was really hard to paint - all those contours, but you turned it into a wonderful sketch. Lovely bold yellow lemons too. 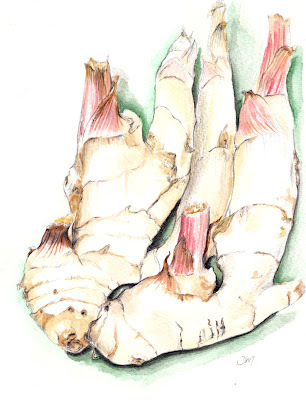 Very nice, the lemon is colorful and lively and fresh, and the ginger is oh so delicate! Revelle, I don't have an Etsy shop yet but will do in the future! For most of my drawings I use paint not coloured pencils now and keep buildind up the washes until it's bright enough.